The birthplace of Starbucks, Microsoft, Boeing and the oldest continuously running Farmer's Market (Pike Place) in the US is also routinely ranked among the most livable cities in the country. Yes, even when it is raining, there's plenty to see and do. 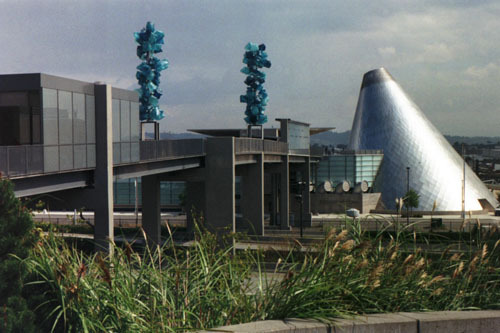 Among its lesser known area attractions are the must-see Museum of Glass in Tacoma, exhibiting some of glassmaker Chihuly's most stunning work; the architecturally pleasing Seattle Public Library; the quirky statue of Lenin and the Troll and Olympic Sculpture Park. If weather permits, be sure to experience the city from the water on a kayak tour or even a ferry ride. Hikers will love the glorious views at Discovery Park. With a couple of extra days, venture further afield and take a day trip to Mt. Rainier, Snoqualmie Falls or even Victoria, British Columbia, which is just one high-speed ferry ride from Seattle. This National Historical Park squeezes into downtown, amid the panhandlers, rowdy sports fans and start-up employees with funky, architectural glasses. Open daily, the visitor center evokes the Yukon rush of 1879-8, when Seattle was a notorious “Gateway to the Golden Fields” for prospectors, the merchants who mined them and the women who – ahem – loved them. In a decade, these stampeders doubled the city’s population to 80,000. But they also swept away Seattle’s mayor in the frenzy over “STACKS OF YELLOW METAL,” as the “Seattle Post-Intelligencer” crowed. Exhibits explore the goods, tents, equipment and infrastructure the Gold Rush hopefuls demanded of this boomtown. Free walking tours depart daily in summertime at 2pm and take 60–90 minutes. The park also has sister sites: one at the northern end of the Inside Passage and others in Canada, including Dawson, the Chilkoot Trail and Thirty Mile Heritage River. Take the light rail from the airport to Pioneer Square, approx 45 mins. Pioneer Square continues to have a salty vibe (quite suited to the Gold Rush theme, in fact). But on winter evenings, when the dark sets in early, non-urbanites may prefer another section of town. Seattle's landmark just turned 100 and faces a $75M sprucing in 2008-9. Famous for its trickster "fish flingers", this rabbit warren also contains boutiques, galleries, antique stores and a large farmers' market. Refuel at the original Starbucks – or sample fierce, black Market Spice tea instead … or a Chinese herbal boost from the apothecary. The market's neon sign towers above Elliott Bay downtown, making it easy to find. Approx 45 mins by light rail from the airport to Westlake Center then walk to the Market. Tour Rem Koolhaas’s iconic design, a $165-million-dollar, ten-story, origami of glass, steel and genius. The main stacks spiral like a seashell inside an ocean of light and color. Unveiled in May 2004, this masterpiece even won over persnickety Herbert Muschamp, the "New York Times" architecture critic. “In more than 30 years of writing, this is the most exciting new building it has been my honor to review," he wrote. The website lists time slots for free guided tours. 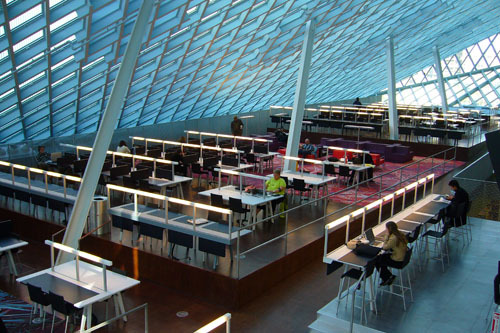 The central library also offers free Wi-Fi, as well as 400 public computers. This is a LEED Silver Certified building with a number of ongoing environmental initiatives. Take the light rail from the airport to University St, approx 45 mins. The Emerald City finally has the exhibition space it deserves, thanks to a recent renovation. The Seattle Art Museum – nicknamed "SAM" – tripled its gallery space and added an 8.5-acre Olympic Sculpture Park on the waterfront, free to the public. Its most thrilling indoor addition is "Inopportune: Stage One" by Cai Guo-Qiang. He suspended nine white Ford Tauruses over the lobby, each impaled by neon tubes, so they seem to explode sequentially. 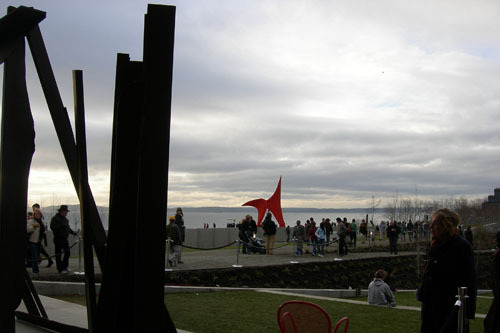 The Olympic Sculpture Park is open and free to the public 365 days a year. Opens 30 minutes prior to sunrise; closes 30 minutes after sunset. The park's PACCAR Pavilion is open Tuesday - Sunday, 10 am to 5 pm; closed Monday. From Labor Day to April 30, the park closes at 4 pm daily (closed Mondays). The TASTE eatery dishes up ingredients "fresh from the market". Locals praise the afternoon sunshine here, but find the stark décor off-putting at night. SAM is at 1300 First Avenue. The Olympic Sculpture Park looms at 2901 Western Avenue. Take light rail from the airport to University Street then walk to the museum. A recent $41-million overhaul brought this attraction back on-line. Even the lobby now amazes: a two-story tank stretches 39 feet across this space — and often contains a diver, who teases the crowd via underwater mike. Watch the Giant Pacific Octopus boil around his two tanks … and through the small tube connecting them. Or examine marine life in the round: salmon, sharks and wolf eels blaze 360 degrees around the glass walls of the Underwater Dome. Above the waves, the otters are crowd-pleasers, bound to slow anyone's exit from this riveting aquarium. From downtown, walk down the Pike Street Hillclimb via the Pike Place Market. The Waterfront Streetcar Line Bus (Metro Rt. 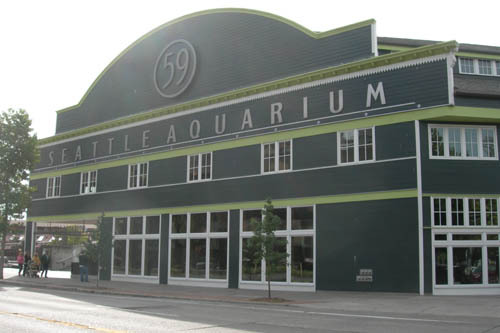 #99) brings visitors right to the aquarium from the International District, Pioneer Square or along the piers. Approx 45 mins by light rail from the airport to Westlake Center then walk to the Aquarium. The greater Seattle area is a hotbed of modern glass design – and the museum is the movement's molten core. Inside its silvery 90-foot steel cone burns the Hot Shop, where guests watch artists at work over 2,000-degree-Fahrenheit furnaces. Exhibits change frequently, but the Bridge of Glass – a pedestrian overpass – continually delights. 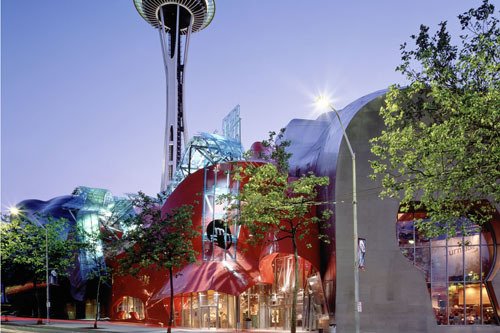 Designed by local impresario Dale Chihuly, it scrolls and swirls 500 feet. Its highlight is the Seaform Pavilion: 2,364 objects suspended overhead that filter natural light, as luminous as any Caribbean reef. An earthy-crunchy café turns out surprisingly good meals here, ranging from poached pear and blue-cheese salad to a caprese sandwich with basil, tomato and fresh mozzarella. On Friday from noon to 1pm, grab a $10 box lunch and head to the Hot Shop for a picnic. Order ahead by 3pm on Wednesday: (253) 572-9593 or gabi@galluccis.com. From I-5 in Tacoma, take Exit 133 (City Center) to I-705. Merge right and take the Schuster Parkway Exit. Turn east – right – at the first light onto South Fourth Street, which becomes Dock Street. One mile down, you'll spot the museum on the left. Tacoma Link light rail is free from downtown. Drivers may even want to park for free near the Tacoma Dome, then ride to the Link's second stop at 19th and Pacific. The Chihuly Bridge of Glass then forms a dramatic introduction to the museum. 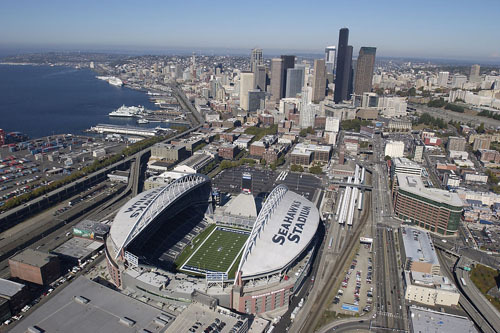 From downtown Seattle, take the #594 express bus or Sounder train. Architect Frank Gehry designed this landmark at the base of the Space Needle to look like hometown hero Jimi Hendrix’s smashed guitar. New York Times critic Herbert Muschamp described it as "something that crawled out of the sea, rolled over, and died." But that should not dissuade any visitors. Not only is the building striking in its eccentricity, it houses two notable collections. Straight from a teen boy’s dream-décor, circa the (first) Tron era, the permanent collections range from first-edition Issac Asimov novels to Heart stage costumes. Music exhibits include local legends Bing Crosby, The Kingsmen, Nirvana, Pearl Jam and The Presidents of the United States of America. It also includes a Sound Lab, where guests can tackle their own tunes (harder than it seems). Visitors have Microsoft Co-founder Paul Allen to thank for all this bounty – he opened the EMP in 2000, then the SFM four years later. Get a unique taste of Seattle on this tour to some of the city's most exclusive local distilleries. Travel by luxury Mercedes-Benz to three small-batch craft distilleries to meet the distillers and get the inside scoop on the cityâ€™s liquor production, from the Prohibition to today. Sample a craft cocktail and more than 12 locally produced liquors including gin, vodka and whiskey, and pair your libations with artisanal bites made by award-winning chefs. This small-group tour is limited to 10 people, ensuring youâ€™ll receive personalized attention from your entertaining and knowledgeable guide. 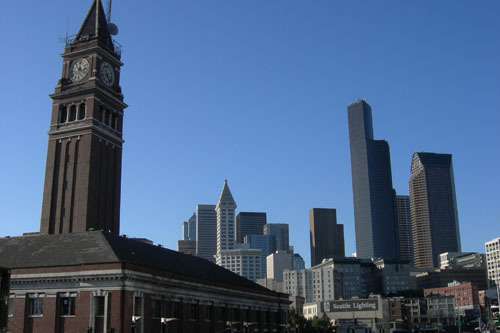 Meet in Downtown Seattle in the late afternoon to begin your Seattle craft distillery tour. After hopping in your luxury Mercedes-Benz Sprinter, your informative, entertaining guide will take you along scenic routes and through picturesque neighborhoods to three carefully selected local distilleries that showcase Seattleâ€™s unique craft distillery industry. Meet the master distillers to get the inside scoop on the distillery business and learn some tricks of the trade. Your guide will also give you some fascinating insight on the history of spirit production in Seattle, from the turbulent Prohibition era in the early 1900s to the lucrative business it is today. Youâ€™ll sample more than 12 local spirits including award-winning vodka, gin and whiskey, as well as finer liqueurs. Sip a unique, seasonal craft cocktail, and wash it down with artisanal snacks made by award-winning local chefs. After your third distillery visit, your guide will drive you back to Downtown Seattle and leave you with a special take-home gift to commemorate this experience. Make your way to the Space Needle at Seattle Center, and present your voucher to head up to the Observation Deck! From your perch at 520 feet, gaze out at the panoramic views of Puget Sound, Lake Union, Elliott Bay, the downtown skyline and, of course, snow-capped Mt Rainier. Snap photos of Seattle’s two surrounding mountain ranges – the Cascades and the Olympics – and watch the bustle of the city’s many waterways, from float planes and ferries to cargo ships and cruise liners. Built for the 1962 World’s Fair, the Space Needle is located in the Lower Queen Anne neighborhood, making it easily accessible wherever you are in the city. If you’re hungry, the needle’s revolving restaurant, SkyCity, offers the epitome of dining with a view. Explore Pike Place Market, Seattleâ€™s top attraction, in a way that most locals havenâ€™t even experienced â€” with an early-access tasting tour. Discover the marketâ€™s many delights as you visit nine different food and beverage vendors for 17 tastings of cheese, salmon, pastries, coffee and more. You can interact with merchants before the crowds arrive, and youâ€™ll have a knowledgeable guide to expertly lead you around, entertaining you with stories about the market's history and culture. This Viator Exclusive is available nowhere else and is limited to 12 people, ensuring you enjoy a small-group experience. 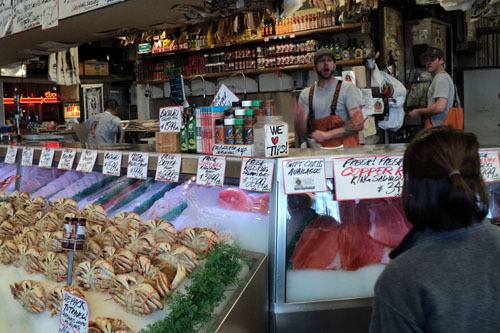 Your behind-the-scenes tour begins inside Pike Place Market at the Market Theater, where youâ€™ll meet your local guide, a Pike Place aficionado who will regale you with fun facts and stories about the marketâ€™s history as you enjoy your 2-hour tour. Come hungry, as tastings are plentiful and add up to a full meal! Spend a few minutes gazing at the infamous chewing-gum wall, adding your own colorful mark if you want. Then head to the main entrance of Pike Place Market, listening to your guideâ€™s story about how the market got its start more than 100 years ago. Your first tasting is a cup of Seattle coffee â€” what else? Learn about how Seattle became the caffeine mecca that it is as a talented barista makes you a latte; steamers and tea are also available if you prefer. Continue your tour around the market, stopping at a total of nine different vendors to enjoy at least 17 tastings, from Seattle mainstays like smoked salmon and gourmet cheese to creative bites like szechuan flatbread. Because your exclusive tour takes place right as the market opens, youâ€™ll avoid the crowds typically found later in the day, offering the chance to chat with vendors and merchants before they get busy. You can even go behind the counter at the fish market to toss a fish through the air, just like the marketâ€™s famous fishmongers. Your last stop is Franâ€™s Chocolates, where youâ€™ll end your tour on a sweet note with a taste of delectable chocolate truffles and salted caramels. These sweets are favorites of President Obama and the First Lady and are given away at the White House. When your tour ends, continue exploring the market on your own, using your included VIP savings card to shop for tasty souvenirs and gifts to take home. The factory tour involves a walk of one-third of a mile, and some steep stairs.